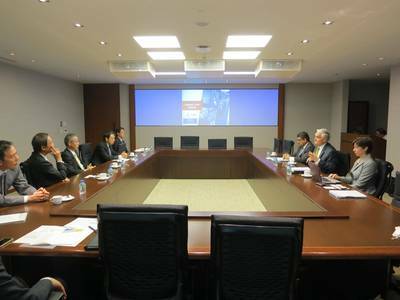 A Panama Canal delegation headed by Administrator Jorge L. Quijano visited Japan to hold discussions with the Japan Shipowners’ Association (JSA) and the major Japanese shipping lines, as well as end customers such as Japanese car manufacturers and energy sector companies. Japan is among the top five user nations of the Panama Canal, as a major importer of grains from the U.S. Gulf Coast and exporter of vehicles to the North American consumer market. Japan’s top three shipping lines: Nippon Yusen Kaisha Line (NYK), Mitsui O.S.K. Lines (MOL) and Kawasaki Kisen Kaisha Line (K-Line) rank among the top 20 customers of the waterway. The delegation also had the opportunity to meet with the Japan Bank for International Cooperation (JBIC) to discuss the progress of the Expansion Program. JBIC is one of the five multilateral institutions providing financing for the Expansion. The Panama Canal Expansion will open new possibilities for the shipments of liquefied natural gas (LNG) through the waterway, which will open a potential for Japan to import LNG from the U.S. Gulf Coast. The Panama Canal held meetings with stakeholders in this sector such as Astomos Energy Corporation, Tokyo Gas and Japan Coal Development Co. Ltd. (JCD). As part of the visit and in commemoration of the centennial of the waterway, a photographic exhibition was inaugurated at the Instituto Cervantes in Tokyo detailing the construction, operation and Expansion of the Panama Canal.